Recently I worked on a Vizio VA320M LCD unit, which, when turned on, would change the color on the front side "Vizio" sign from yellow to white and stop there. There was no sound and no picture in the unit, but it would respond to power off command and switch back from white to yellow. My first thought was that it was a problem on the inverter, but after a little research I found that it wasn't. How can you know it's not the inverter? Well it's simple: you can see the +5V line on the power connector and you can measure it to see if there are +5V there. Then you can measure the "back light on" line (BL_ON) and see that there is no logical 1 there (namely anything above 2.5V). You can take that a step further and short the two, i.e. pass +5V to the BL_ON signal on the power connector and see the back light come on and stay on. So the problem was apparently in the main board. In my case it turned out to be either BGA soldering on the main board's processing IC gone bad or, possibly, memory corruption which was blocking execution of the main startup program leaving the TV in a somewhat un-initialized state yet good enough to allow shutting it down. It is clearly meant for absolute gurus and luckily that's what we are because we managed to properly diagnose and solve the problem even despite their help. Anyhow, properly fixing the board required either BGA reworking or firmware flashing, i.e. service protocol reverse engineering and although a lot of fun, this also tends to be time consuming so we opted for leaving that for other high-end projects and just replacing the main board. Here is the interesting part: Vizio VA320M comes , as often happens these days, in two different implementations: one is with an LG LCD panel and the other is with an AUO LCD panel and according T-Con board. It's the same TV model, you can't tell the difference from the outside, but on the inside it uses two different display panels and different drivers for them. Our main board was CBPFRD1KA1 and we couldn't find any store that was offering it, not at any meaningful price anyway. So eventually we searched for "VA320M main board' and we found the following on SJ: "New Vizio CBPF9D1KZ2 Main Board for VA320M". 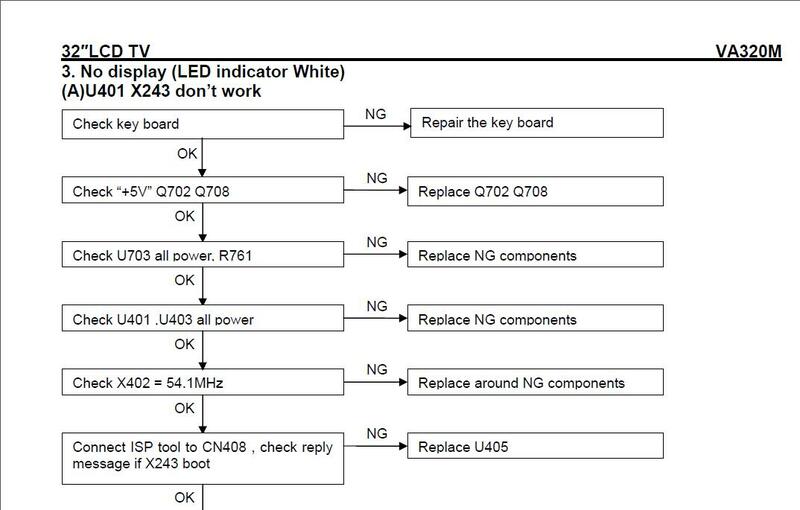 As listing clearly stated, this was from the TV version that had AUO LCD and the VA320M that we had was with the LG LCD...but what other chances we had? It was still faster (and cheaper) to get a working board than try to reverse-engineer the service protocol possibly after re-flowing the main IC on the board. When the board arrived two days later we plugged it in out of curiosity and, not surprisingly, the TV came on...except it had some badly messed up colors. So what we ended up doing was replacing the LCD signal matrix encoding IC U405 on the working board with the one from the original LG board. To make it easier for the operations we temporarily removed one nearby capacitor. 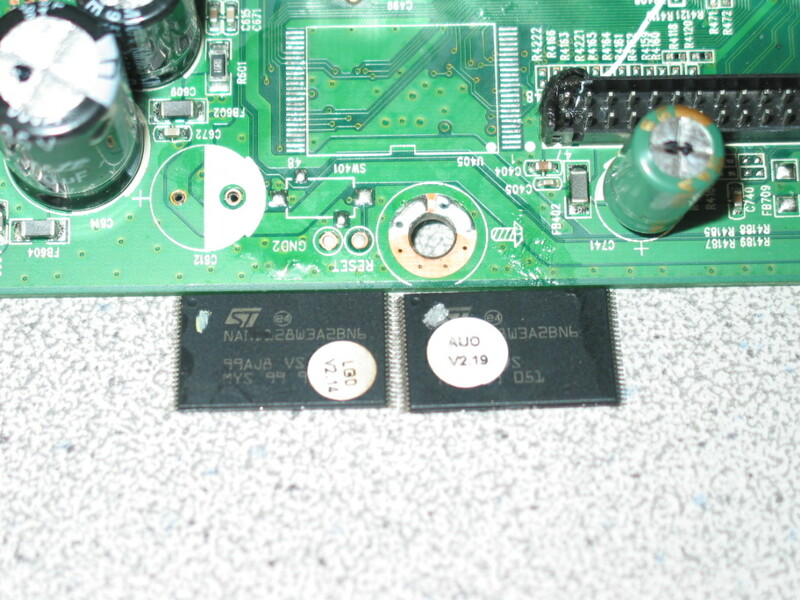 As you can see one of the ICs has an AUO label and the other has an LG label. It was a precision job, but not nearly as difficult - or risky - as re-flowing the main IC on the faulty board. Very informative post. I actually had the same idea since a replacement for my LGD-version board is nowhere to be found. One question: how did you manage to solder on the old U405 without inadvertently shorting any of the pins? Thanks for the post, I have however a quick question. I also have a va320m (with the LG LCD). The symtom is as described by you: Upon plugging the power cord the vizio logo on the front comes on yellow. Then, the TV is responsible to the power button (upon pressing it, the logo turns white), But nothing happens on the screen. Now: I tested the leads on the power supply (the ones which connect to the cable going from the power supply to the main board) and only the +5v are alive, I have no power on the 24v or 12v. My question: Did you tested those in your TV and they also show no power?